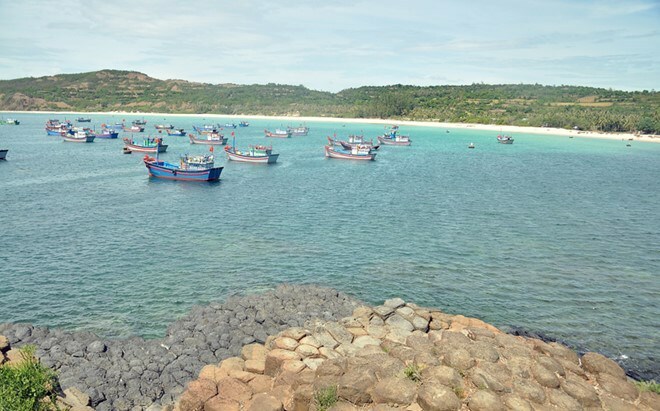 Phu Yen (VNA) – The south central province of Phu Yen on March 28 released breeding shrimp and fish into the waters around Ganh Da Dia – a well-known tourism spot in the locality – to re-generate fisheries resources. The ocean release event was part of activities taken by Phu Yen to mark 60 years of Vietnam’s fisheries sector. It has become an annual activity in Phu Yen to protect the local ecosystem, popularise adherence to lawful regulations, and raise public awareness of the role and value of fisheries resources as well as the shared responsibility of preserving the resources and natural ecosystem. Addressing the event, Nguyen Tri Phuong, Vice Director of the provincial Agriculture and Rural Development Department, reviewed the traditions of the Vietnamese fisheries sector, while calling on the community to engage in protecting fisheries resources. He encouraged fishing vessels to catch fish in the appropriate seasons, using proper net sizes, prioritising off-shore fishing, and avoiding destructive fishing or other activities that harm the environment. Following the launch ceremony, more than 600,000 breeding shrimp and fish were released into the sea.